The tax law changing the tax exemption on South Africans working abroad has now been fully promulgated and takes effect on 1 March 2020. The initial implementation date of 1 March 2019 has been extended by Parliament to specifically allow employers and expatriates to plan their tax affairs before the implementation date. 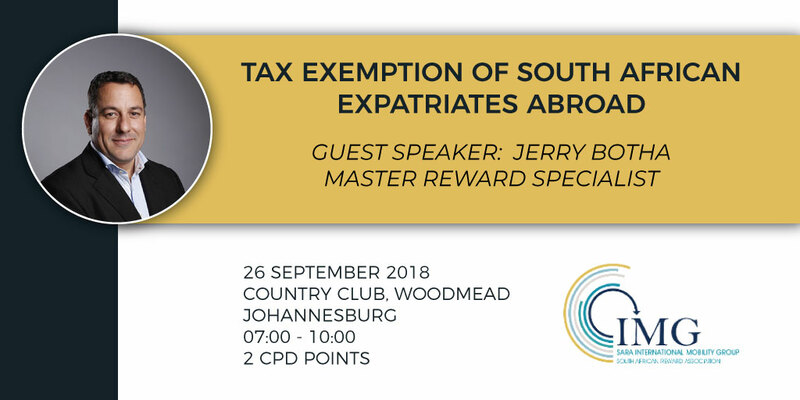 Guest speaker, Jerry Botha, will cover insights into the law changes and key considerations for future expatriations. Jerry represented the Expatriate Petition Group and SARA members in submissions to the National Treasury and Parliament that were material in tapering the initial recommendation of total removal of the 183- and 60-day exemption to the now promulgated R1m tax exemption threshold. Strategies we have seen adopted by employers to plan for the change and minimise or fully mitigate the impact of the changes.